Robert Lukins was born in Kingstone, Somerset, in 1821 and baptised at All Saints church, Kingstone (near Chard), on 9 December 1821. He was the sixth of the ten children of agricultural labourer John Lukins (1791-1875) and Sarah née Brook (1791-1855). John and Sarah's children were; Joseph (1809-1859), Betty (b1812), John (b1814), Thomas (b1817), William (1819-1882), Robert, Susannah (b1823), George (b1826), Nathaniel Augustus (1830-1912) and Mary Ann (1836-1862). In the 1841 census the family were listed in Kingstone and 15-year old Robert gave his occupation as a 'Shoe M[aker]'. In the autumn of 1842 in the Chard Registration District (but probably at Kingstone), 21-year old Robert married 20-year old Caroline Frost (1822-1906). They initially settled in Taunton, where they had their first two children but by 1846 Robert had moved his family to Yeovil. Robert and Caroline's children were; Mary Ann (b1843), Sarah Jane (1844-1914), Virtue (1845-1906), Susan (b1852), John (b1854) and Robert (1856-1894). In the 1851 census Robert, Carolyn and their three eldest daughters were listed in Middle Street. Robert gave his occupation as a cordwainer, that is, a shoe maker. Living with the family was Robert's 15-year old nephew Barnard Lukins, who was Robert's apprentice. By the time of the 1861 census, Robert had moved his family to Wine Street, where they would remain. Robert gave his occupation as a shoe maker and his daughters Mary Ann and Sarah Jane worked as shoe binders. By the 1871 census, all the children except Robert (the youngest child), had left home. Robert Snr gave his occupation as a 'Shoemaker employing 1 man'. By 1891 most of the children had left home and the census of that year listed Robert and Caroline, both aged 69, at 3 Wine Street. Robert gave his occupation as a boot and shoe maker. Living with them was their widowed daughter 29-year old Susan Down and her two sons; 9-year old Reginald and 7-year old Harrison. Robert died in Yeovil on 8 June 1893, aged 71. Caroline died in Yeovil in 1906, aged 85. As a postscript, it would appear that after his father's death in 1893, Robert Jnr returned to his parent's property in Wine Street and set himself up there as a grocer (see Gallery). However, this business was not to last since Robert Jnr died in Yeovil in the winter of 1894, aged just 37. The entry of Robert's baptism of 9 December 1821 from the register of All Saints church, Kingstone. 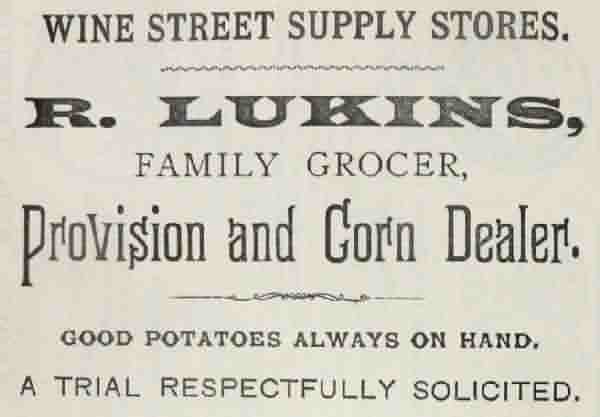 This advertisement for Robert Lukins Jnr's grocery in Wine Street appeared in the 1896 edition of Whitby's Yeovil Almanack Advertiser - even though Robert Jnr had died in 1894. Did his mother Caroline continue to run his grocery business?